Sheffield FC took the bragging rights in the local derby at Bracken Moor with a 1-0 win over Stocksbridge Park Steels. A scrappy game was decided by a fortunate goal on 61 minutes in a game that was hampered by a strong s wind. Glyn Cotton’s wind assisted corner on Club’s left went directly into the net amid Steels goalkeeper David Reay’s complaints he had been held by a Sheffield player preventing him getting to the ball. Sheffield made a bright start with winger Jamie Gregory going on a typical run but over-hit his cross with the ball dropping well wide. Benny Igi-Ehon tried his luck from that Reay gathered at the second attempt. Steels lost striker Scott Ruthven on 15 minutes with a hamstring problem. The home side created a half chance five minutes later when Corey Gregory turned his marker in the area but, from a tight angle, put his effort over the far upright. Sheffield lost central defender Hafrez Hamzat injured having only just returned from a spell on the sidelines. The first half finished with a flurry with Cotton putting a diving header high over the bar from Jamie Gregory’s cross, while at the other end Corey Gregory put an inviting ball across the face of goal that just needed the finishing touch. Sheffield had edged the first half but Stocksbridge came out after the break on the front foot and almost made the breakthrough in the first minute. Ben Turner’s lofted clearance was caught by the wind and Corey Gregory on Steels left set up a good chance for Joe Lumsden that Club keeper Andrew Robertson did well to block. The keeper was in action again pushing Jack Poulton’s effort wide. Reay had to be alert to save at the feet of Cottom then did well to push away substitute Warren Mason’s low drive for a corner, from which Cotton scored the winner. Stocksbridge probed for the equaliser with on-loan Brodie Litchfield forcing Robertson into a good save with his legs. Then with substitute Adam Hinchliff about to pull the trigger in the area it took a superb last ditch tackle by Turner to prevent the midfielder getting his shot away, while in a well- worked move three minutes from time Poulton curled an effort just over the angle. 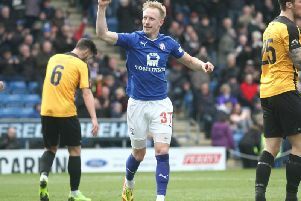 But it was Sheffield’s day as Andy Kiwomya’s side kept a first clean sheet in 11 outings, while his opposite number Chris Hilton will feel his side did enough in the second half to warrant a point. Lee Morris came off the bench to score both goals as Shaw Lane Aquaforce maintained their title hopes with a 2-0 win at Belper Town. Morris replaced the injured Gavin Allot early in the game before winning and scoring the penalty that saw the Ducks take a 31st minute lead after Belper had made the better start. Morris then wrapped up the points wit the second midway through the second half with a simple tap in from Rob Youhill’s low cross. In the Premier Division, Frickley Athletic beat Grantham Town 3-1 at Westfield Lane courtesy of a Jacob Hazel hat-trick. Hazel opened the scoring on six minutes sprinting clear from Jarmeel Ible’s though ball to score with a fine effort from 18-yards. The second arrived three minutes from the interval with Hazel tucking away from a tight angle after latching onto a poor headed clearance. Grantham pulled one back just before the hour as Rhys Lewis turned in a cross at the nrea post. But Hazel put the game beyond doubt on 67 minutes forcing the ball home from close range to complete his treble. Buxton come back from behind to win the Derbyshire derby 2-1 at Matlock Town. Premier Division: Buxton v Nantwich Town, Ilkeston FC v Matlock Town, Whitby Town v Frickley Athletic. Division One South: Shaw Lane Aquaforce v Stocksbridge Park Steels, Sheffield FC v Belper Town.